Players have always found ways to have their thoughts and messages delivered to a much larger audience, and the days of Twitter and Facebook have done very little to change the most primal and rudimentary form of doing it, a message written in sharpie on a t-shirt. Any player these days has a legion of followers on Twitter or Facebook, but nothing seems to get that message across better than a t-shirt with some handwritten message on it that can be displayed during a goal celebration. For some reason, that act of rebellion seems to have a much larger impact than a plain message being sent through the internet. It makes the players almost human and connects with all of us, and shows us a side that we are not always privy to. Some messages are funny, some are heartfelt, some are political, but all are personal to the one displaying it. 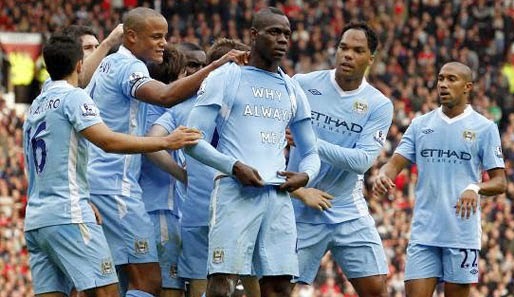 Here is what I consider five of the most iconic t-shirt messages displayed by footballers during a game. After scoring the winning goal in the 2010 FIFA World Cup against Netherlands, Andreas Iniesta, used that moment to give his condolences to former footballer Dani Jarque. Dani Jarque had died of a heart attack at the age of 26 the previous year, and Iniesta used the greatest stage in the world to once again ensure the memory of Dani Jarque continued alive in the memories of all us. 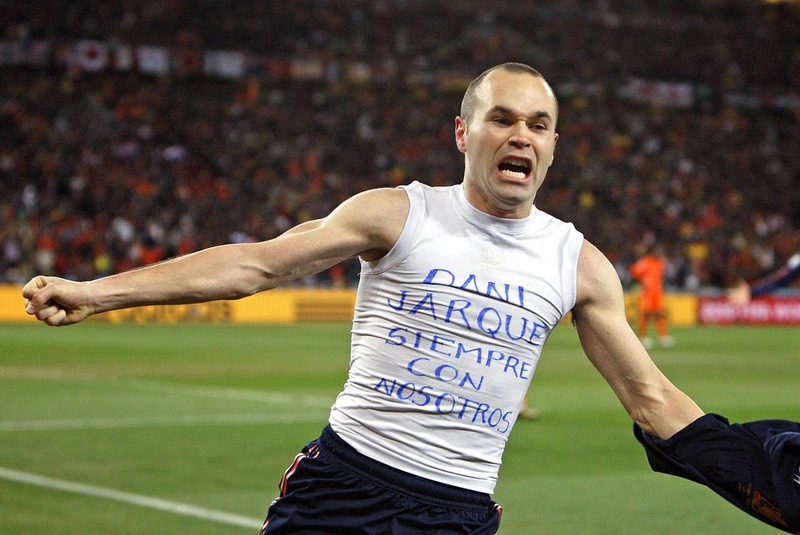 The message on his t-shirt said: “Dani Jarque Always with Us”. 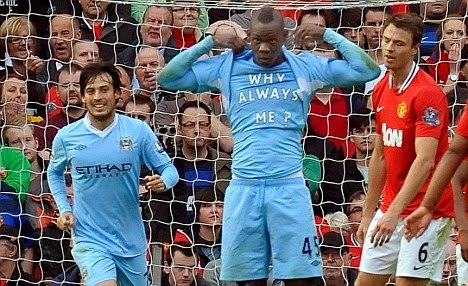 The now infamous “Why Always Me” t-shirt is sadly one of the highlights of Mario Balotelli’s time at Manchester City. After scoring against Manchester United in the Manchester derby he revealed a t-shirt with that message, becoming almost instantly a cult hero for City fans. If there is one thing Balotelli is not known for is his cool and collected personality, and that goal celebration was a microcosms of what Balotelli is and what he represents. After a heartbreak loss in 2005 to Liverpool in the Champions League final, AC Milan would finally win the trophy in 2007 against the same opponent. At the end of the game, Kaka, fell to his knees and removed his kit, showing a t-shirt with a message that read “I Belong to Jesus”. His deeply religious believes were on full display during that significant victory in a true display of his own convictions and believes. 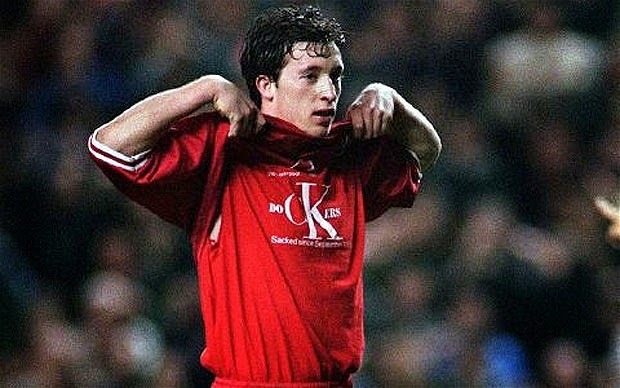 One of the t-shirt messages that perhaps most marked English football was the one worn by Robbie Fowler during the European Cup Winners Cup in 1997 against Brann. It was done in show of support for the 500 dockers that had lost their jobs since 1995. It was a very political driven message that affected Liverpool and its supporters, done in one of the largest stages. He was already a cult hero at Liverpool, after this he ensured that his name and Liverpool would forever be intertwined. He did a few t-shirt messages during his playing days, but perhaps none was as witty as the one he wore in 2000 when Arsenal played Liverpool. 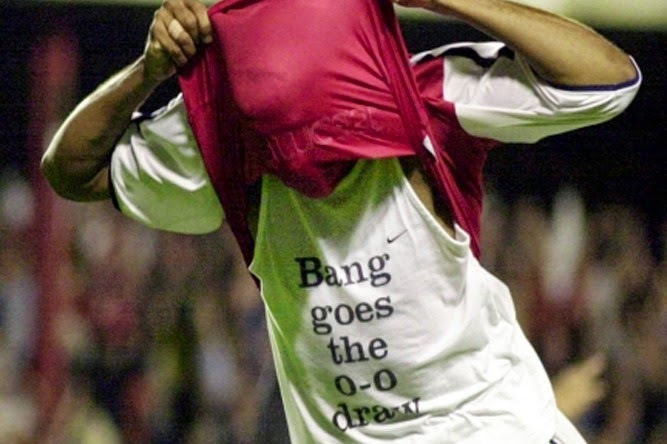 He scored the winning goal for Arsenal, after three players had already been sent off during the match, and once he gave his team the lead, he lifted his kit, displaying the message “Bang goes the 0-0 draw”. The goal not only won Arsenal the game but it broke a three year drought in which no Arsenal player had scored against Liverpool.